The TwEECer began with two Mustang enthusiasts crossing paths, via e-mail, and having similar interests but different technical backgrounds. I (Mike Glover) am a software developer and Troy Eiland is an Engineer with extensive design and QA experience. Troy and I "bumped" into each other via email, when he had a question regarding some software that I had written. Since Troy was a DSP engineer and I was trying to implement a ROM Emulator to plug into my C&M harness, I took the opportunity to ask him a FEW questions. Well as luck would have it, he had a blown 86 GT which he had converted to MAF, and we were off and running!!! Building on some excellent work from MANY people on the EEC Mailing list, allowed us to have a working prototype in about 4 months. Troy did all of the design and firmware development. I started on what would eventually become CalEdit and gathering as much information regarding Ford calibration parameters. The RT feature was not even in our thoughts as of yet. The first time I sat in my car with one of the prototypes and was able to switch between the two calibrations I had written to the EEPROM (one with the stock idle of 672 and the other with a value of 1200), and switched between them while the engine was running, well I almost split my face with the grin that I had. We have heard from many customers that have had similar experiences and are very proud of what we have accomplished. We feel that we are providing a COMPLETE product to market for which the home enthusiast can afford and benefit. Beginning in 2001, I formed Slower Traffic Keep Right Software and began producing and selling the original TwEECer (This unit interfaced through the PC Printer port). In 2002 I changed the company to Slower Traffic Keep Right, LLC and finally, just Slower Traffic Keep Right (STKR) in 2005. The Fall of 2002 saw the release of the TwEECer RT and I began producing and selling the TwEECer products full time. Being comfortable and successful with the corporation he had already been with for quite a while, Troy decided to not participate in the venture full time, but has contributed over the years as a consultant and providing repair & diagnostic services. In the Fall of 2004, we moved to our current location, where I still work from home. I have received many compliments regarding our customer service. The fact that most inquiries & support requests get immediate to next day responses, really seems to impress our customers. I no longer work those long hours, just like everyone else, I need my down time. I try to keep as normal of business hours as I can. My hobbies include playing guitar, sports (Basketball, Martial Arts, Golf, Baseball), hunting, fishing. I spend way too many hours messing with my HTPC (Home Theatre PC) running XBMC and MythBuntu. Giving my kids a hard time is one of my favorite past times. I have three sons, ages 10, 12 and 18 (as of 10/2010). All three are extremely polite, respectful and intelligent. No man could be more proud of his children. I very much look forward to seeing what they can accomplish in their lives. My Wife of 13yrs (as of Jan 2011) has kept me honest, pointing out my own Bull S*** (as I do so often to others) and lets me know when I am being a Hypocrite. I reciprocate with extreme prejudice, when I take her to task. We are definitely Yin/Yang. Like PB&J, we just go together naturally. Well, that is a brief account (probably more than you wanted to know) of how the TwEECer came to fruition and how it has affected our lives. 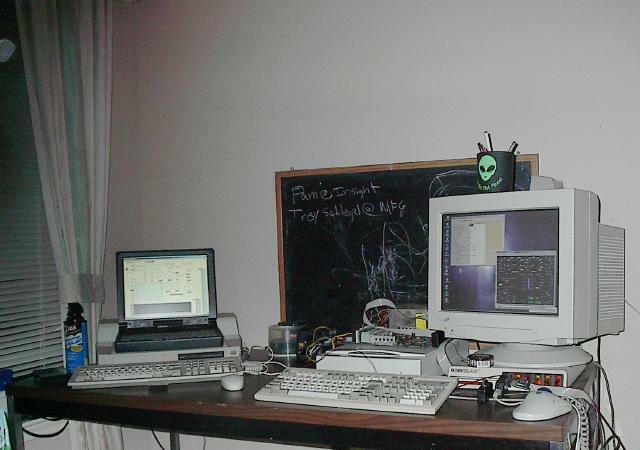 Below you can see my 2nd work area at our first home, this was in 2001. My wife kicked me out of the bedroom office as I was working about 20hrs a day, keeping her up at night with my squeaky chair. I tended to lean back in it every few minutes while digesting information or deciding how to handle some feature, etc... this is where I spent most of my time each day.